Municipal officers, who are working across various departments, have different working hours, and at times even one single department has different working hours irrespective of the timings that are assigned for the duty. Smartcity-311 application can be configured to capture a real-time and date of inspections and map it with duty slot automatically. The application works on both the modes online and offline when we are capturing the date and time on the smartphone. It also stores the date and time of data on the server database, which will helpful for users to track any falsified reports or exceptions. “Draw”, which is most commonly known as redlining a picture, giving you the ability to draw a line, circle or an arrow without any hassle. Just use your fingers as pen and you can draw and highlight areas on the pictures. Moreover, you can also find many draw tools like different types of brushes, pen sizes, erasers, color picker and more. “Zoom” is one such feature that helps the inspectors while taking a photo of an inspection site. Many a time, you are standing at a portion that doesn’t allow you to capture the actual details about the site or maybe there is any obstacle in between that you can’t cross over to get near to that site for which you wanted to take a picture. This features allows you to click a clear picture by standing at a certain distance from the object. Based on the users’ logged on to SmartCity-311, the system automatically tags officers’ information to the inspection report like his first and last name, department, designation, telephone number/contact information, ward & zone information, etc. In any case, if any officer is promoted or transferred to a different location or department or he is assigned with a different role, all the new field reports filled by that officer will adopt the new changes not affecting his earlier filled reports. Since Smartcity-311 offers a flexible permission based on the reporting system, it becomes a lot easier to implement a hierarchy reporting based on the credentials like Area/District Officer, Assistant Area Director, the officer he reports to, Legal name of the establishment an officer is associated with, the address including City, State and County, which needs to be printed on reports. Apart from visual confirmation like photograph or any kind of media, the most important element that SmartCity-311 application gets is the GPS location (latitude and longitude), where the inspection has been carried out. Through GPS location, you can get an assurance that inspections were done on-site and not falsified. GPS tag inspection reports assure smart reporting that is also known as Geo-spatial reports or Geo-enabled reports or location enabled reporting system. Moreover, GPS co-ordinates captured along with the field inspection reports, allowing users to generate meaningful and powerful visual map reports in both formats like Latitude/Longitude and Decimal degrees (Lat Long/DMS) over Google earth applications. Since the GPS data stored in our system, which is a subset of OpenGIS standard, it allows Smartcity-311 app to generate reports, which calculate (a) Distance between 2 points (Euclidean geometry) is good example or you can use inspection of the Road Checking/Paving work inspection, (b) Determine if the point is inside a polygon, a right case of this is finding the Ward/Zone/boundary of a given GPS location, using latest database technology like object shapes rather than the Minimum Bounding Rectangle (MBR.) Further, we are also calculating spatial relationships for field inspections. Moreover, you can also define Task Specific Categories such as the most recent “Swine Flu inspections” using the backend system, which has time-bound visibility as the inspections are carried out within the season. Instant and to the point communication is the key to success in any system. When it comes to take example of Facebook or Twitter, which are the most successful social networking applications, giving the ability to comment or deliver feedback on a post. Considering above example in mind, we have enabled the officers to comment on their own post that can be on any ongoing project. However, the senior officers are also capable of tracking the progress by constantly checking this post and commenting if necessary. Whenever any other officer makes a comment to the post, a notification alert will be sent to all the stakeholders of that particular inspection report so that the officer can easily tap on the notification and he/she will be taken to that report directly. With the inspection report, all the comments can be easily feed and maintained. 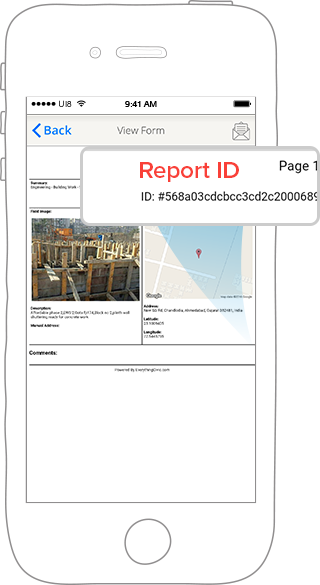 Moreover, inspection data, location details and comments and Inspection site photo are also listed in the inspectors’ log and displayed in the Inspection report/PDF as generated by system. Email Field Inspection Report is one of the most useful features of Smartcity-311 for field reporters, allowing them to email field inspection reports instantly from the field. Users of this application just need to click a button and our system will generate a detailed field inspection report as a PDF and emails you on your desired email address. Today, various cities like Ahmedabad and more have now brought the field inspection report to their mainstream process of approval of bills. It means, every single invoice/bill submitted by the engineering department for payments have to be attached with Field Inspection reports generation from Smartcity-311 application. With this system, there is an evidence that no invoices submitted have to be manipulated with and the officer, who is responsible for the work, has inspected the site and is also responsible and accountable. With this inspection report, all the inspections are carried out on a timely and authoritative manner, ensuring proper audit will be conducted during inspections. Searching and reaching the exact spot of reporting, where the inspection was carried out earlier is quite daunting task. Let’s take an example: Mr. X, who is your colleague, had filed a Public Toilet Inspection report approximately a month ago. Now, he is on leave and you are replacing him and you are assigned to perform the inspection. As urban as well as slum areas are highly populated, it is not easily possible to sprawl the exact location. But Smartcity-311’s GPS data of inspection that done by your colleague has been saved and using that report, it will be easy for you to find that exact place to continue your inspection. While viewing any of the old or already updated field report data, you can find a small “car” icon over the map that can direct you to that location. Using Google Maps API and the latest smartphone technology, we can provide you with the routes to navigate to the pinned landscape. Different routes and directions will be established upon the inspector’s current location and travel preference. It also comprises turn-by-turn driving directions from your current location to the target location. It also recalculates route when you make any wrong turn or change course. Moreover, it will also provide walking and public transit directions along with driving directions as it natively available on android devices. Field officers, who take time to report every single field report and see that their work is noticed by the senior officers, are expected to get more engaged in their job. It is called a self-reinforcing loop. Psychologically, it’s a human behavior that makes people happy and the whole system benefits from it. The feature “Viewed By” in Smartcity-311 app is especially designed to boost the user-engagement. Let’s take an example to get clear idea of this feature: Suppose Mr. A is an assistant engineer at Municipal Corporation and Mr. B is the Commissioner. If Mr. A creates and submits a field inspection report that can be viewed by Mr. B on his device, the application will send a notification to Mr. A that Mr. B has viewed your report. Mr. A can also see the comments on his reports if any. A survey has been conducted by us on officers of municipalities, we found that the most officers have common complain that their work never get noticed or appreciated by the seniors. But the “Viewed By” feature has resolved this problem as senior officers can easily view any report of any officer and appreciate him/her for his work. Many a time, we all feel that there are not enough hours in a day to get all our work done. Especially, it happens with a field officers, who have to fill various field reports, but they wanted to save it or bookmark it so that they can talk about it when they have one-to-one meeting with their seniors. 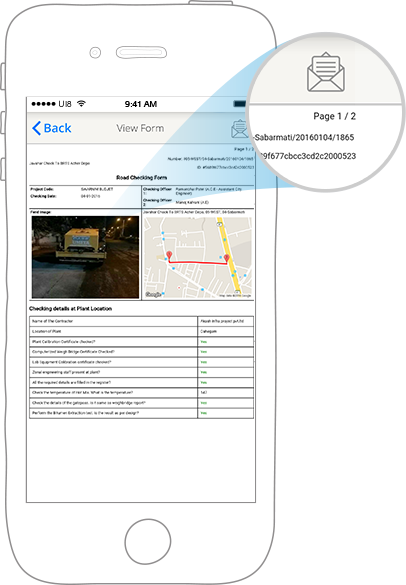 Smartcity-311 application comes with a bookmark feature, allowing you to bookmark any report to refer it later. Just one tap and you are ready to go with the entire report. For example, if you opening the same engineering report again and again that is not done as per expectations, you just need to click and bookmark the report to instantly open it. Within “My Stuff” section of Smartcity-311 application, you can find a complete list of such bookmarked reports and can open any report instantly. In short, we can say that this feature allows you to save any report for future references so that you don’t have to go back and start searching for it from scratch. This will save a lot of time and efforts, and ensure that the next time you attain any meeting, open the application and visit My Bookmark section. With just one click, you can find complete field report data that you want and you are already. A lot of field inspection reports have been created so far and submitted by your staff. Whenever you open any Field Inspection report, you see that the system shows you all the reports from the database. Sometimes it is right, but many a time, these field reports need to filter the data based on specified criteria. Using the filter tab, you can easily divide and filter the reports, and another one is data into sections and groups, which can be sorted in 4 ways. At the time of working with field Inspection, huge data can be captured, and creating significant reports of that data is essential for the decision making process, allocation of resources and creation of presentation. Inside Smartcity-311, we are allowed to display maps and data points on the maps. For the individual inspection report, Map View is also obtainable, so users can hap Map View for particular data category or date range or one particular zone. We deliver mainly two types of map views such as Pin and Heat Maps. Map based reports can be easily generated or viewed on mobile devices and from our Web based CRM.